This is in the current issue of Georgia Music Magazine, with wonderful photos by Christopher Davis. 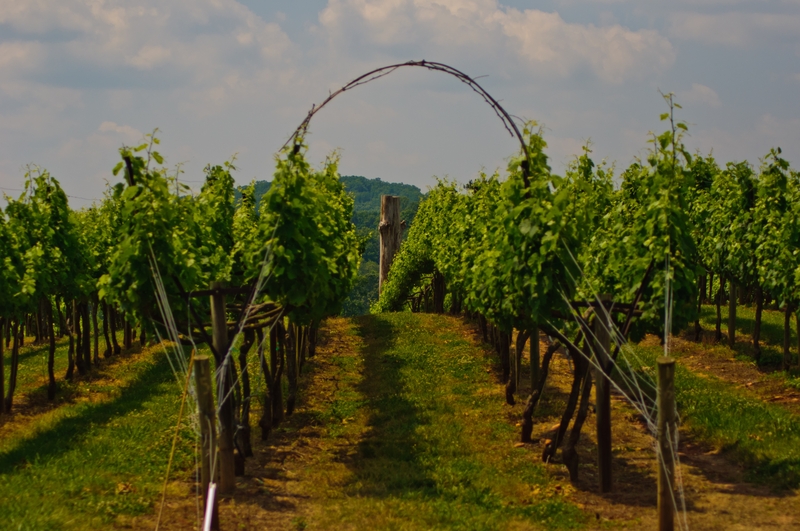 The Georgia Wine Highway stretches from Young Harris to Savannah, but most of the state’s wineries are clustered, often side by side, in north Georgia, where the fruit of the vine enjoys a felicitous pairing with live music. Roddenberry’s long-suffering ache of a voice sounds momentarily soothed, and around the crowd, glasses clink. “In vino veritas!” whoops some oenophile, who, judging by his twang, is as locally produced as the Cabernet he is sipping. Georgia’s viticulture started in the early 1980s as a bold farming experiment that since has ripened into a genteel tourism industry, with the state expected to double its 30-plus wineries over the next decade. Their concerts and music festivals have become such mainstays that they occupy their own column of weekly listings in The Dahlonega Nugget newspaper’s entertainment section. Just as these vintners bring different varietals, blends, and levels of pouring generosity (or stinginess) to their tasting rooms, each winery is developing its own musical personality as well, catering both to local tastes — banjos are usually handy, if not always picked — and to the tourists and Atlanta day-trippers who constitute a sizable contingent of Sunday brunches. Habersham Winery, one of the state’s oldest, appeals to area hipsters with a sort of gourmet-Bonnaroo vibe, grilling portobello items for the vegetarians. At Chateau Elan, the 3,500-acre, francophile complex of vats, golf, spa and conference rooms in Braselton, the demographic tends toward the more seasoned and well-heeled, who dance the shag during the Carolina Beach Music concert series, featuring old-school legends such as the Jesters and the Embers. Dahlonega’s Italian-themed Montaluce — translation: “mountain light”– keeps it elegantly mellow, too, with classical guitar and harpists, and on weekends during the busy season, Tom & Juli Theobald, those versatile stalwarts who can perform just about any cover. They breathe a discreet sigh of relief when someone calls for John Prine after three Jimmy Buffett songs in a row. 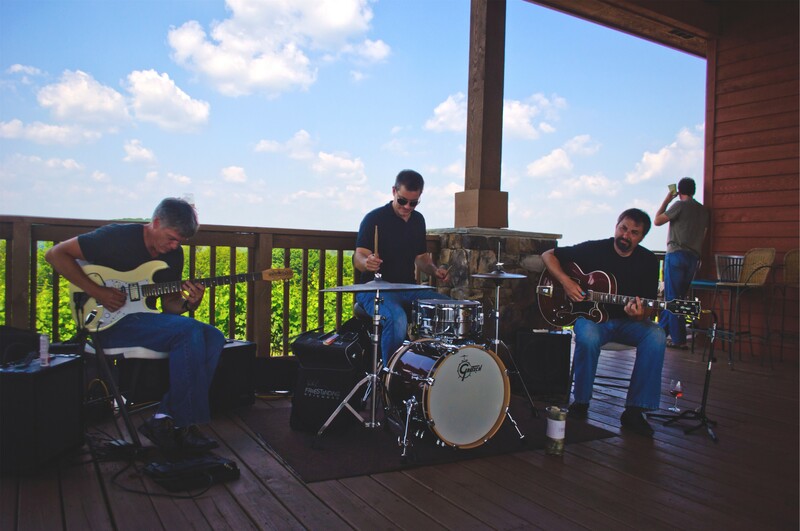 The thumping heart of the winery-music scene, though, is Frogtown, the tiny, unpaved Lumpkin County enclave that historically was known for its moonshine. With neighboring wineries — Three Sisters, Blackstock, Frogtown, and, just up the road apiece, Wolf Creek — the picturesque district attracts a steady stream of pickers’ trucks alongside Jaguars with Fulton County tags, braving the paint-dinging gravel driveways. In its “Grill & Chill” series, Blackstock cranks up the volume and shuffles the playlist by offering a season of blues followed by a few weeks of top-shelf jazz, culminating with a Wine and Music Festival that, this year, was heavy on tenor saxophone. Three Sisters, named for its view of a triad of mountains, whimsically embraces its red-clay terroir, with a tasting room full of face jugs and folk art by Howard Finster and Cornbread, and a cuddly proprietor usually wearing overalls and a grin: Doug Paul, whose background in the music industry has informed his operation since its inception as Lumpkin County’s first vineyard. He and his wife, Sharon, worked for 30 years in broadcasting, recording, and voiceovers and, during the 1980s and ’90s, owned their own studio and record label, Catspaw Productions, in Atlanta. During that time, they organized concerts for 99X, and, today, just for kicks, they operate a 50-watt radio station from their winery, playing whatever strikes their eclectic fancy, from bluegrass to big bands. He notes that Zac Brown used to jam at Three Sisters “before anyone else had heard of him,” and Curtis Jones, a local flat-picker who has toured with Allison Krauss, is another regular. As Paul is ticking off names of other gifted home-folks, Rick Harris, a witty jazzer who just moved here from Florida, takes his trumpet to the stage to sit in with The Buzzard Mountain Boys. The sound is not so much retro as retrofitted. With a mixture of irony and affection, these young music-makers tinker with old-timey material and mannerisms, but their songs and packaging groove with indelible originality. Decked out in fedoras, cat’s-eye glasses, and baubles from the vintage rack at Stefan’s , they pack the house at the Star Bar, the Highland Ballroom, the EARL; Sister Louisa’s “Church”; and other intown nightspots where militant idiosyncrasy reigns. Bernadette Seacrest and her Provocateurs; Sodajerk; and Blair Crimmins and the Hookers all bring polychrome verve to their sepia sensibility, crooning in a past-perfect tense of their own making. If these acts constitute a trend toward nostalgia, it is purely accidental — they all insist they are just following their own flask-tipping, Gatsbyesque muse. Last year, the band released its debut CD, “The Filthy South Sessions” with themes of diners and God’s purported drinking habits and other minor-key numbers she describes loosely as swing noire. She and her gallant accompanists are scheduled for regular shows at the Highland Ballroom while gearing up for another spring tour of Europe. For rowdier, roadhouse swagger, check out Sodajerk, which bills its sound as “y’allternative,” or “The Replacements meets Johnny Cash.” Founded by Kevin Charney and Alex Brenner who perform respectively under the stage names “Poppa John Tucker” and “Bucky Goldstein,” the players — like these other “old wine in a new bottle” acts — are in their 30s, the time when nostalgia pangs kick in. Since migrating South in 2005, the duo has added bassist Blake Parris and “Saint” Freddy McNeal, taking pedal-steel cues from Atlanta’s “Redneck Underground,” and they are anything but slick and sugary with songs that toy with tear-stained jukebox tropes about “drinking and killing yourself” such as “Carbomb (To the Heart)” and their crowd-pleasing standard, “F— n’ Fight.” “We, um, excised that last one from the recordings we sent our mothers,” Charney says sheepishly. It’s not a real Saturday night of honky-tonkin’ without a shiner or two, they figure. Sodajerk will play Smith’s Olde Bar with the Bottle Rockets on January 7. He sings and plays guitar, banjo, and ukulele, backed by the brass of the Hookers, named for the band’s “commitment-shy, revolving door policy.” Their prop-heavy concerts usually incorporate P.T. Barnum-worthy themes — the Gypsy circus, cabaret with “dancing girls,” or vaudeville. Blair Crimmins and the Hookers are planning a release party on February 4 at the EARL for two new singles available only in vinyl and digital downloads.